Brown Sugar 117 full wig has a natural texture that delivers maximum comfort so you feel no irritation only satisfaction. We never compromise when it comes to quality, which is why Brown Sugar delivers the best results when it comes to styling and lasting durability. 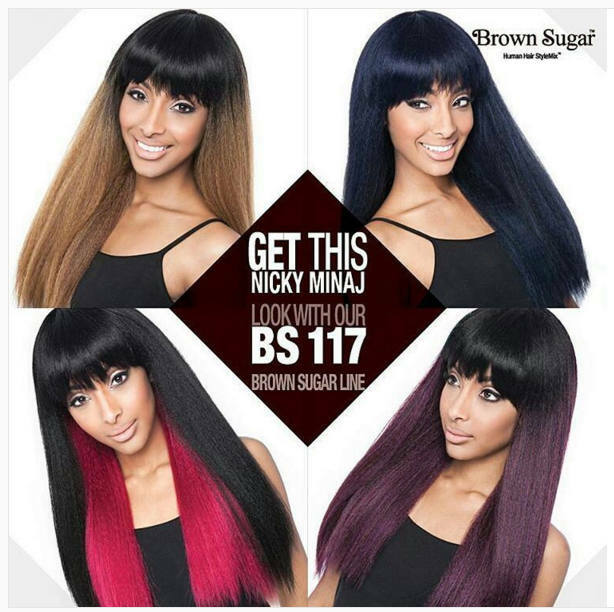 Brown Sugar 117 resembles Nicki Minaj’s celebrity inspired long sleek style with china bangs. Turn heads with BS 117 a stylish look with natural textures that feel like your own. Brown Sugar, the Best Natural Taste in 100% Human Hair Style Mix Wigs! Our goal is to ensure your complete satisfaction. If, for whatever reason, you are dissatisfied with your purchase, you can return it to Luxe Beauty Supply within seven days of receipt and subject to conditions set here. Once we receive and inspect your items, we will credit your Luxe account. Please allow 3-5 days for a credit to appear on your account. All items are subject to a 15% restocking fee. We do not offer cash refunds. Please see returns instructions here. For more information, check out our Support Center on returns and exchanges. Processing Time referred to as "in-house processing" is between one to three business days. It is the time from when the order is placed until it leaves our facility. Orders are processed in the order they are received. Orders for in-stock merchandise placed before 1PM EST Monday through Friday are usually processed the same day. Orders placed after 1 PM EST Monday through Thursday will be processed the next business day. Orders placed after 1PM EST on Friday will be processed the following business day Monday/Tuesday. Shipping/Transit Time varies by the chosen method during checkout. It is the time from when the order leaves our facility to when it is delivered to your address. Isis Brown Sugar Human/Syn Full Wig BS 222. Skin Friendly, Naturally Soft Comfortable. Isis Brown Sugar Human/Syn Full Wig BS222 is made of 100% Human Hair Style Mix.